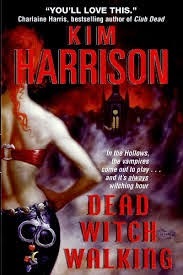 Dead Witch Walking by Kim Harrison is an urban fantasy story that is full of action and humor. The story takes place on an alternate Earth; one where a genetic engineering mishap wiped out a good chunk of the human population. This led to supernatural beings being able to come out and live openly among humanity. Things are not all brotherly love, as in the book’s setting most supernatural beings live in a supernatural ghetto across the river from Cincinnati called the Hollows. The main character is Rachel Morgan, a witch and bounty hunter. She leaves her career with the I.S., a law enforcement agency run by supernatural beings charged with policing supernatural beings, in order to go solo. This causes her many problems, such as her old boss seeks revenge, she becomes caught up in criminal intrigue, and has to deal with roommate issues with her living vampire friend. Dead Witch Walking starts a little slow but soon turns into a rollicking pulp adventure. The depiction of magic is detailed and adds to the verisimilitude of the story. The characters are fun and believable. They all have quirks and flaws that make them relatable. For example, Rachel’s vampire roommate is not just some uber-powered vamp, she is also an OCD control freak. My favorite part of the book is that it was plain fun to read. The action and humor kept me turning the pages. Since this is the first book of a series, the author sets up many mysteries and issues to be dealt with later. There is just enough to whet the appetite of the reader, and this volume still stands along as a satisfying solo story. I would recommend this to urban fantasy fans who like pulp-style action. Harrison’s universe has a Shadowrun feel to it, as paranormal creatures and magic users have come out of hiding to co-exist with the normals. If I were to run a game in this setting, I would probably use something like GURPS or Fate. For further information I will direct you to Timothy Brannan’s blog, The Other Side (of which I am a fan). He has done some great character write-ups for Rachel Morgan in various rpg systems. My favorite is for the Amazing Adventures rpg, which is perfect for pulp-style play. Awesome! I loved this book when it came out even if I didn't like Rachel all that much. But the character really grew on me and now she is one of my most favorite witches ever. Yeah the universe really is very Shadowrun like. I should try to do Rachel as a Shadowrun character. But it has been years since I have played. I really like urban fantasy settings where the supernatural is out in the open, such as this one (and Shadowrun! ).